Urban Archeologist: Could 2012 be the end? Could 2012 be the end? If this little guy isn't worried...why should we? 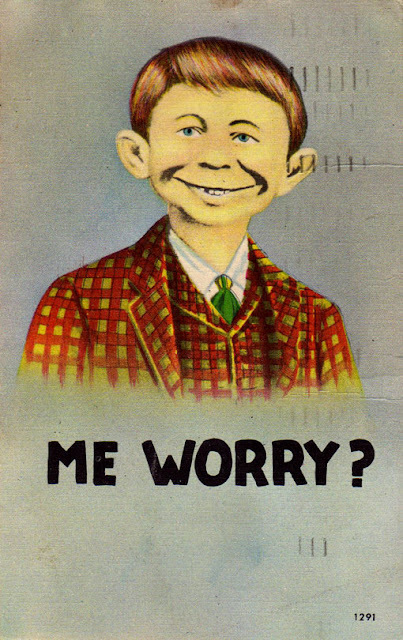 Some of the origins of Alfred E Neuman have been covered in this blog here. He was of course popularized when he became the symbol/mascot of MAD magazine. He has been around much longer. 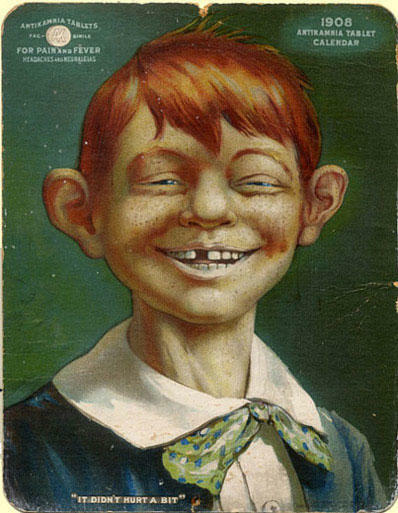 The original artist saw him used (intentionally, I presume) in an ad from 1908 for a pain and fever tablet. Anyway, back to the subject of this post. I think the fear that the world is coming to an end is good business for a lot of news outlets. Fear is a big seller and motivator, so if it saves a few jobs I guess I am all for mis-information. If you want the real truth...that's what blogs are for. Now, if the Mayans were still around and talking about the coming of the end...then I would be nervous. Personally, I don't think it'll be the end at all and silently chuckle at those who insist it is. We can't predict it. If I was God, I'd wait until the day after then shout out "Gotcha!" Too bad they Mayans didn't predict it for April 1st, 2012. You're Cured! That'll be 50 cents, please.